In the summer of 1969 I heard about this big rock concert that was going to be happening in upstate New York. My friend Steve Rubenstein and I drove across country in his Volkswagen beetle. It took about 53 hours. We perfected the technique of switching drivers and catching some sleep. First we went to the Atlantic City Rock Festival, which was a kind of buildup to Woodstock itself. Then we spent some time in New York City, and we bought our Woodstock tickets there. I don’t think most of the people who ended up going to the concert ever actually purchased tickets. At some point, the fence came down and people just came in for free. But we had come across the country for the Festival and we had no idea what Woodstock was going to become, so we did all that was required like going to any concert. In New York City I met up with my other friend Ken Hammermesh, who I knew from the dorms at Berkeley. We were at Woodstock so early that we had our choice of any seat. There was a high fence right up on the side of the stage, so the best seats were back just a little, so that you could see over the fence. So we found a perfect place at the right distance and in the middle, and essentially never left there for three days. I must confess that the entire three days I was high on MDA, the early form of manufactured mescaline, an early cousin of MDMA or ecstasy. So food was never a problem, and we just left periodically to pee. 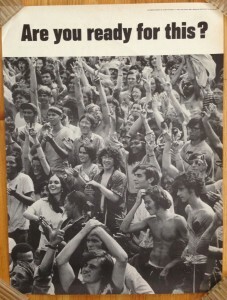 The “Are You Ready for This?” poster came out in 1970 just after the concert. No one expected that half a million people would show up for a music concert. It was a sign to all of us in what was then called the “counter-culture”, that we had tremendous strength in our numbers. 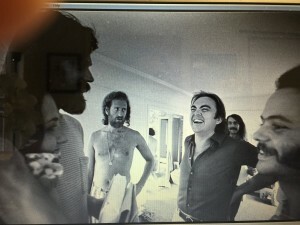 Individually and in small groups having males having long hair and using drugs was pretty “radical” behavior back then. We were called “hippies” or “freaks” of course. Neither name did I feel negative about–I was proud to be a freak compared to what I saw in the general culture. When everyone was together, it was clear that this was not crazy behavior. And the conventional establishment was pretty blown away at the numbers of us–it was a moment of the whole nation awakening to the strength in numbers of the Flower Power generation, the Summer of Love hippies, the counter-culture altogether. 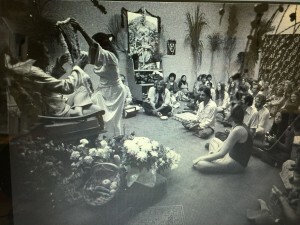 Bhagavan Adi Da pointed out that about half of the early devotees in Los Angeles had come out of this counter-culture in one way or another. And He did not feel that there was anything negative about it. He talked about how the opening that using drugs and alternative lifestyles had brought had allowed people to have sufficient availability to find Him. So it was part of what was necessary for Him to have a gathering of devotees in those early days. I heard about the poster from friends before I ever saw it. People told me I was in the front of a Woodstock poster, really big. So at one point I went to the Print Mint or a similar place in Berkeley and there I saw the poster. And there in the front is myself and Ken. Here is a closeup. I had graduated high school that January, and had not cut my hair since. In those days, long hair was not allowed in high school, and so now I could let it hang out. It was to get the length of the middle of my back before I finally cut it off. I bought three copies of the poster. I showed my parents and they had to have one. And they framed it, and it is sitting still on the living room wall in the house I grew up in, in Los Angeles. I had two with me when I became a devotee and one day showed one to someone at the Mountain of Attention. They said, “We have to show this to Bubba.” And so He saw it and was highly amused. He said that we had to put that picture into the Adidam Archives. He said that it should be there because He wanted history to know that so many of His devotees came out of that hippie generation and even had attended Woodstock. Of course, during the time of the Woodstock Festival, Adi Da Himself, was precisely in Mumbai in the temporary Ashram of Swami Muktananda. He was there at Captain Ram Pratap’s apartments where Swami Muktananda was staying all through that August of 1969. Another note along this line. 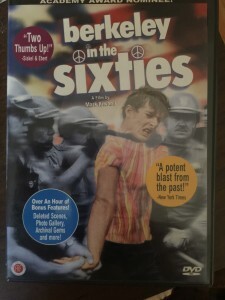 The next year a movie made about the Woodstock festival, called just Woodstock and directed by Michael Wadleigh. It was shown in movie theaters all over the country–I saw it first run in a movie theater in Tucson in 1970. But then years ago, when it came out on DVD, I thought it might be fun to look at it again. 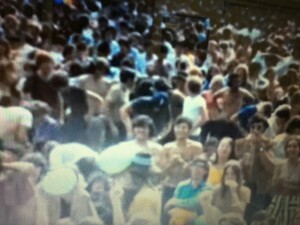 I had found that anytime there was a closeup scene from the crowd in front of the stage at Woodstock that I could often find myself. And so I thought that maybe I could see myself in the movie. There is a scene where the farmer who owned the land upon which the Woodstock Festival happened (actually Bethel, New York), speaks. His name is Max Yasgur. And during his little talk they zoom in on the audience and sure enough, they zoom in again on me and my friend Ken. Please excuse my indulgence but I will chronicle one more little piece of the old history. Just before Woodstock, that spring, I had been attending the University of California, from January 1969 through June 1969, and mostly lived there all summer as well. This is what was known as the People’s Park time. A group of students and Berkeley residents, started to use as a park, an abandoned lot that the University owned. People had meals there, played music there, danced there, smoked dope there. One night the police came and put a big fence around the whole park, so that the next day, it was not usable to anyone. (That evening, I happened to be in the Park when the police arrived, and went around informing people everywhere to come to the Park because it was being “taken over”.) This started a wave of protests against the University and then a response from the police. People were beaten by the police, tear-gassed, arrested, and actually every single day there was a protest of some kind or other. I was happy to participate every day, as a 17 year old freshman just out of high school. 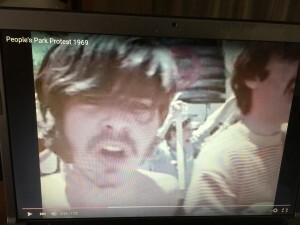 And noticed when I looked up on You Tube about People’s Park recently that there was a video of the kind of protest I would have been at. And then, sure enough, there I was. As might be expected, in my life, peace and understanding only came when I read The Knee of Listening and The Method of the Siddhas and came to Adi Da Samraj’s Feet. Yep, counter-culture meant something back then: counter to conventional culture! I didn’t have the nerve (yet) to flat out ignore my parents dictates. 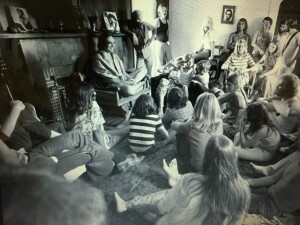 but years later I was living in a straight up hippie communal household when I discovered the Teaching. We had a huge organic garden, milled our own flour, and held big vegetarian Indian feasts. Everybody in that house ( about 10 of us) had their little library of spirituality and mysticism. I was practicing astral projection, yoga, and just starting to get involved with a kundalini/Shakti yoga teacher named Amrit Desai. It was his devotee who had a copy of ‘The Garbage and The Godess’ in his library. One day while hanging out with him I asked him what that book with the funny title was about. He took a deep breath, exhaled and just said,” Tom, all I can tell you is every time I read that book I get so upset I don’t know what to do.” That’s all I needed to hear. He left. I sat down and didn’t move until I had read the whole book. I was a devotee in that moment as I am today. That was 1977. I meant, the nerve to go to Woodstock. Damn. That story brings tears to my eyes. ” Those were the days my friend. We thought they’d never end ‘ . thank you sir.